It’s not fun to have this much bad news to report on, but at times, it is necessary. 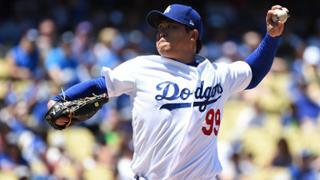 Hyun-Jin Ryu got his first win in 971 days on Sunday, but he will have to wait at least ten more days to get another chance. The Dodgers placed him on the 10-day disabled list with a left hip contusion that he suffered on Sunday. Dave Roberts announced that Ryu is expected to miss only one start while on the DL. Ryu suffered the injury while sliding into second base in the fourth inning on Sunday. Ryu remained in the game but is now on the DL until May 11 at the earliest. The Dodgers recalled right-hander Josh Fields from Triple-A. The righty has been up and down between the Dodgers’ bullpen and the bullpen of the Oklahoma City Dodgers. It is his third stint with Los Angeles this year. He last pitched on Friday.